First frost of the year on Mt. Hallasan! Anyone living in Korea would have noticed that there was a significant drop in temperature yesterday. While Jeju was still warmer than much of the mainland, there was a noticeable chill in the air across the island. Of course, one place that this chill was extra noticeable was on Mt. Hallasan. 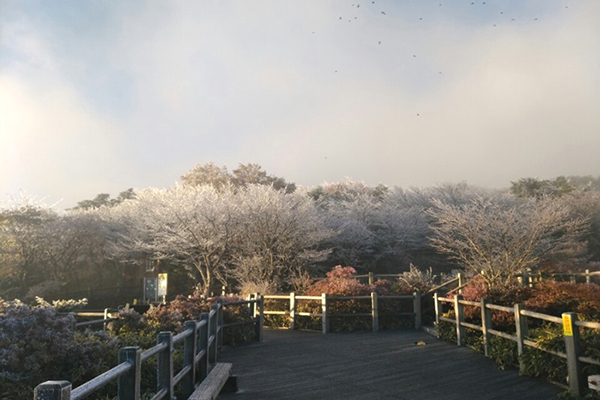 At 1,950 ft, Hallasan is the highest point in both Jeju and Korea and as such it was much colder than the rest of the island. This, combined with the drop in temperatures yesterday, meant that the mountain had its first frost of the year! According to the Jeju Provincial Meteorological Administration, the temperature on Mt. Hallasan hit a low of minus 2.3 degrees yesterday. As the temperature on the mountain fell below freezing, ice formed, most noticeably on the trees. This created some pretty spectacular patterns that would no doubt give anyone who chose to climb the mountain yesterday something to remember. The reason for the strange patterns on the trees is when fine water droplets, such as those found in fog and clouds, freeze instantly when they hit the tree branches. As well as this ice, the fall colors on Mt. Hallasan had just reached their peak at the weekend, meaning that hikers yesterday had no shortage of beautiful views to take in. The cold spell is expected to continue today, with a slight rise in temperature happening from the Nov. 1.